New agency guidance describes the steps to take if an Automatic On-Board Recording Device (AOBRD) breaks down. 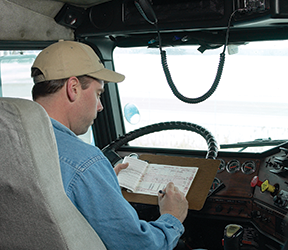 AOBRDs are electronic logs that pre-date the electronic logging devices (ELDs) that most commercial truck and bus drivers were required to use in place of paper logs starting in December 2017. AOBRDs that comply with 49 CFR Sec. 395.15 are “grandfathered” and may be used in place of ELDs until December 2019. The ELD rules have specific steps to be taken if an ELD malfunctions, and now the Federal Motor Carrier Safety Administration (FMCSA) has issued new guidance to extend similar requirements to AOBRDs. 1. Note the AOBRD malfunction and notify the motor carrier in writing or electronically within 24 hours. 2. Reconstruct your logs for the current 24-hour period and the previous 7 consecutive days on graph-grid paper or electronic logs that comply with Sec. 395.8, unless you already have the records or can get them from the AOBRD. 3. Continue to prepare paper or electronic graph-grid logs until the AOBRD is repaired, but this “should not continue for more than 8 days after the malfunction is discovered,” the FMCSA says. As with ELDs, the motor carrier may request an extension of the 8-day deadline by submitting a request to the FMCSA division administrator in the state of the motor carrier’s principal place of business. This request must be submitted within 5 days of the driver’s notification of malfunction.